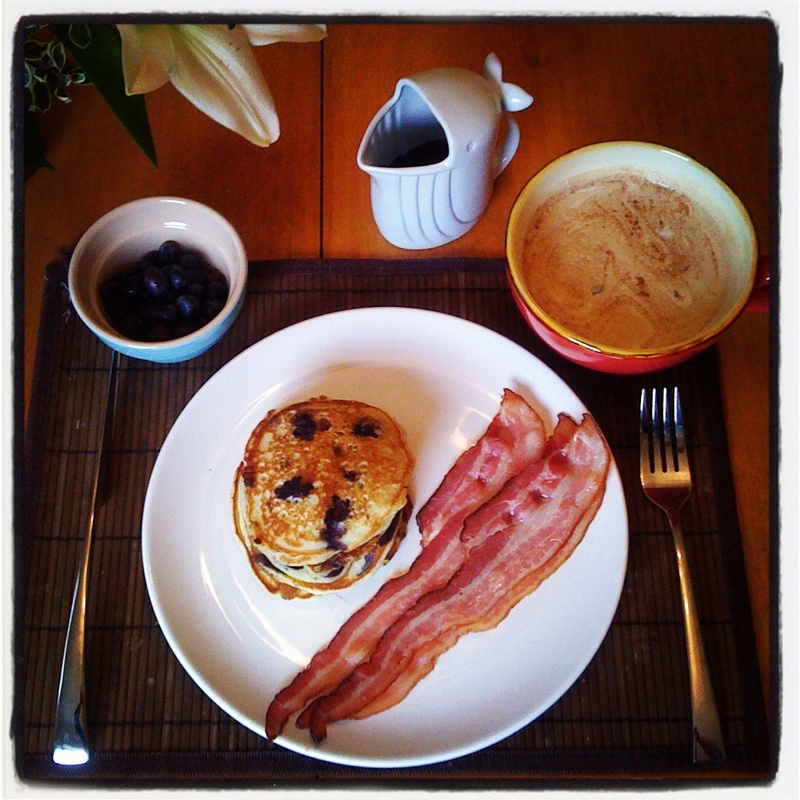 Sunday morning breakfast has become something of a ritual ever since Dr. J and I got together. I usually whip up something easy, like pancakes and bacon or eggs, bacon and hash browns, and he makes the coffee, sets the table and grabs the morning paper. (Yes, we still get a physical newspaper, and no, we’re not 80-year-olds.) I also like to put on some music, perhaps a little Django Reinhardt (okay, fine, maybe we are kind of like 80-year-olds). Over the years, I’ve tinkered with several pancake recipes, like banana caramel, lemon ricotta and chocolate chip, and sometimes mixed it up with Belgian waffles, challah French toast and Danish ebelskiver. But I’ve finally settled on a recipe that I know will be my go-to in the kitchen, mainly because it doesn’t require running out and getting extra ingredients–you should have everything on hand already. Besides, grocery shopping in your PJs? Not cute. Combine the milk and vinegar in a small bowl and let it sit and curdle for five minutes. Whisk flour, sugar, baking powder, baking soda, and salt in a large mixing bowl. Gently fold in blueberries or other fruit if you like. Heat a large skillet over low-medium heat, and brush lightly with oil. Pour 1/4 cupfuls of batter onto the skillet, and cook until bubbles appear on the surface. Using a spatula, flip and brown on the other side. Makes enough for two very hungry people or four semi-hungry folks. A couple of tips: I like to keep the pancakes warm in the oven on a cookie sheet while I go through the whole cooking process. 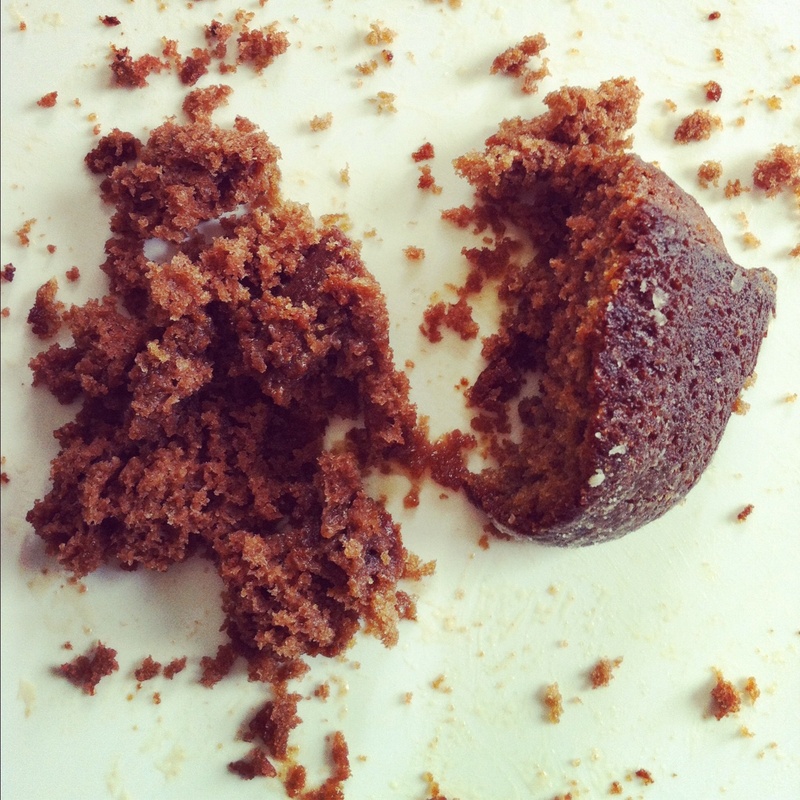 Also, if you have any left over (unlikely), just stash them in the fridge and pop them in the toaster tomorrow morning. Here’s a little Django to go along with breakfast and ease you into the day. Happy Sunday! Still. Learning how to can and preserve is still at the top of my to-do list for 2012. Hopefully the experience will be food poisoning-free. Ok, so full disclosure here: Kate Leahy is the very talented cookbook writer/cook/epicurean genius behind the food blog A Modern Meal Maker, and she also happens to be one of my good friends. We met while we were both doing our master’s degrees at Northwestern’s Medill School of Journalism and have been talking about food ever since! She not only has an impressive culinary background, but she’s also co-written the famed A:16 Food and Wine cookbook, which came out in 2009. (See my at-home A16 feast here.) And now she’s gone and collaborated with Paul Virant, the acclaimed executive chef at Vie, a Michelin-starred New American restaurant in Western Springs, Ill. that specializes in seasonal cuisine, to create what looks to be a truly beautiful cookbook that’s jam-packed (ha) with recipes for preserves, such as jams, relishes, pickles, brandied fruits and conserves. The second half of the book apparently pairs the recipes in the previous pages with seasonal menus. Example: brandied cherries in a cherry clafoutis and smoked spring onion relish with chicken fried steak. Yum! So I may be biased toward this book, since my friend co-wrote it, but it’s worth checking out if you’re really interested in preserving and canning technique since Virant is quite the expert on the subject . If you’re like me and just can’t wait to get your hands on a copy, you can pre-order it at Amazon.com (naturally). This might be the push I need to finally invest in a pressure canning set. Or at least get over my angst over botulism in general. Congrats, Kate, on putting another fine cookbook on your shelf! My beloved mushrooms meet their fate. It seems like only yesterday that my shiitakes were but wee spores. I tended to them every day, carefully misting them three times a day and following every instruction in the handbook–even going so far as e-mailing the mushroom patch company to ask someone questions about the welfare of my little ones. Then they started growing like gangbusters in girth and height virtually by the hour, reaching 1 inch in diameter, then 2, then 3. After they stayed at nearly 5 inches in diameter for a couple of days, though, I knew they were good and ready to be harvested. I feel sort of silly even typing this, but I actually felt the slightest tinge of sadness when I cut the stems and chopped them up. I’d invested quite a bit of time and effort in my patch, and even though I only got two mushrooms out of it, they were the very first fungi I’d ever grown, on purpose anyway. A girl never forgets her first shrooms. 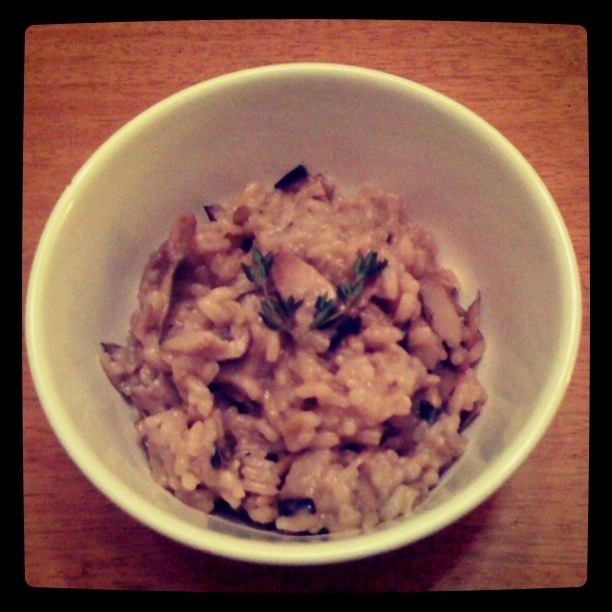 At first, I thought about just sauteeing them with a little butter and salt, but then I found this drool-worthy Epicurious recipe for Wild Mushroom Risotto. Dee-licious. So what now? It looks like my patch is dormant at the moment, so no more updates for a while. Hopefully, the next time I get a flush of mushrooms, they’ll grow bigger and badder than the first ones. Maybe I should get some advice from Ian Neale, a Welsh farmer whose vegetable-growing prowess caught the attention of a certain hip hop star who also happens to be a fellow gardening enthusiast. Gong Xi Fa Cai! Let’s Eat! There are lots of things to love about Chinese New Year, no matter what your cultural heritage is–firecrackers, dragon and lion dances, lively drums, gorgeous red paper lanterns lighting the night sky…and the FOOD. Oh, the food. It’s amazing that there aren’t more obese Asian people, given the way we gorge ourselves on special occasions and our zest for food in general. 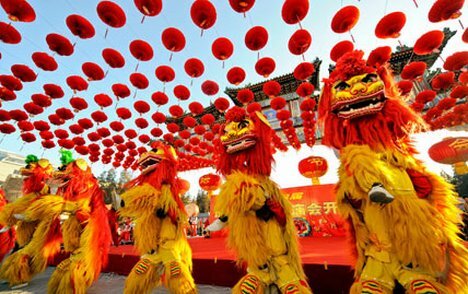 Basically, Chinese New Year lasts 15 days, and kicks off with a New Year’s Eve reunion dinner (or, more precisely, feast), featuring some key foods, each of which have a symbolic significance. 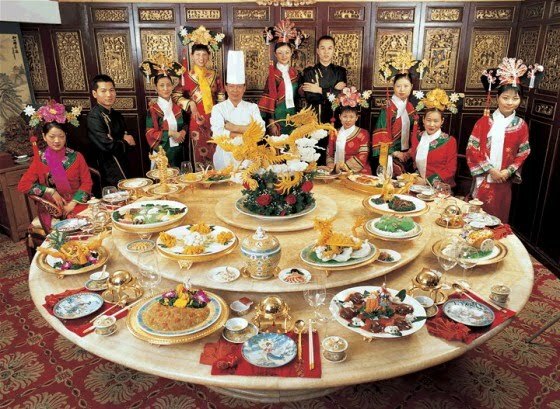 The feast usually includes whole fish, perhaps a steamed red snapper or rock fish with a soy, cilantro, ginger, sesame oil and green onion sauce, to signify prosperity and abundance; jiaozi dumplings filled with pork and green onions or leeks, which stand for wealth; spring rolls, which resemble gold bars and signify good fortune; oranges and/or tangerines to bring luck; nian gao, or Chinese New Year cake, made with sweetened glutinous rice; and some kind of noodle dish, which signifies longevity. Trying to eat egg drop soup is SO much harder while wearing a fancy empress hat. Since I’m only a half Chinese (and not a very good one at that), I didn’t really go all out and make a big meal over the weekend. Growing up, my family never really got into the full swing of things during CNY. Sure, we did the whole red packet exchange thing (we kids really enjoyed that), and there was the occasional ten-course dinner at a Chinese restaurant, but it was nothing big. That didn’t stop me from cooking up Cantonese seafood chow mein, which happens to be one of my favorite Asian dishes of all time. 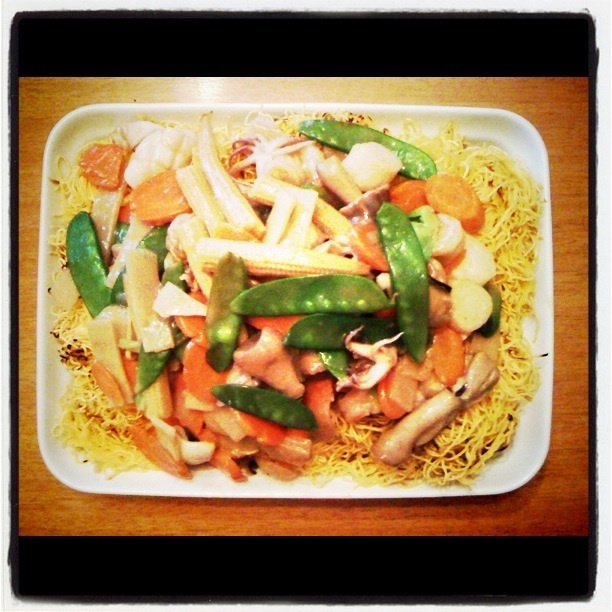 Featuring a colorful mix of veggies and seafood in a brown gravy, all sitting atop a pile of crispy, golden pan-fried noodles, Cantonese seafood chow mein is, in my humble opinion, the perfect balance of textures and flavors. It’s also kind o f hard to find, especially among Americanized Chinese restaurants. Usually whenever I order it, it turns out to be a mess of greasy, thick noodles in a gross, flavorless sauce, topped with mystery meats and limp veggies. 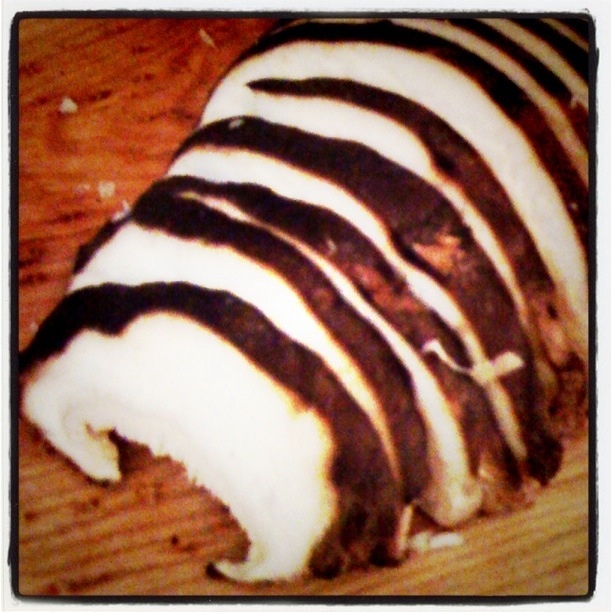 Usually, I’m a slave to cookbooks and recipes–I’m trying to remedy this in 2012–but when it comes to Asian foods, I take a more intuitive approach. Sure, I still use recipes as guidance from time to time, but usually I’m flying by the seat of my pants, paying little to no attention to measurements. 1) Pat shrimp, scallop and squid dry with a paper towel, and toss with 1 tsp. cornstarch, 1/2 teaspoon salt, white pepper and minced ginger and garlic in medium bowl. Cover and refrigerate for 30 minutes. 2) Mix oyster sauce, 2 tbsp. cornstarch, water, sugar and sesame oil. 3) Preheat oven for 10 minutes at 300° F.
4) While oven is preheating, heat 2 tbsp. oil in a wok on high until hot. Reduce heat to medium. Gently lower noodles into the wok to avoid splashing hot oil and cook until golden, using chopsticks or a fork to separate and flip noodles as they cook. If noodles are not browning and look a little dry, then add 1 tbsp. vegetable oil. Remove noodles from heat and place in a heatproof platter, and keep warm in the oven. 5) While noodles are warming, heat 2 tbsp. oil in wok again on high until hot, then turn down to medium-high heat. Pour in scallops and shrimp and stir until halfway cooked, then stir in squid. Cook until shrimp are pink, scallops are firm and opaque, and squid are opaque and slightly curled, about 5-7 minutes. Remove wok from heat and pour seafood mixture in a medium heatproof bowl. Set aside. 6) Return wok to stove and heat up remaining 1 tbsp. oil on high heat until hot. Turn down heat to medium, then pour in carrot, water chestnuts, bamboo, baby corn, mushrooms, wine and remaining 1/2 tsp. kosher salt. Stir fry for 2 minutes. 7) Stir in chicken broth, and bring mixture to a boil. 8) Cook uncovered for 1 minute, then stir in snow peas and bok choy with the oyster sauce/cornstarch mix. Stir until thickened, then return shrimp, scallops and squid to the vegetable mixture. Season to taste with additional kosher salt and white pepper as needed. 9) Take out the noodles from the oven, then pour contents of entire wok over the noodles. Serve immediately. 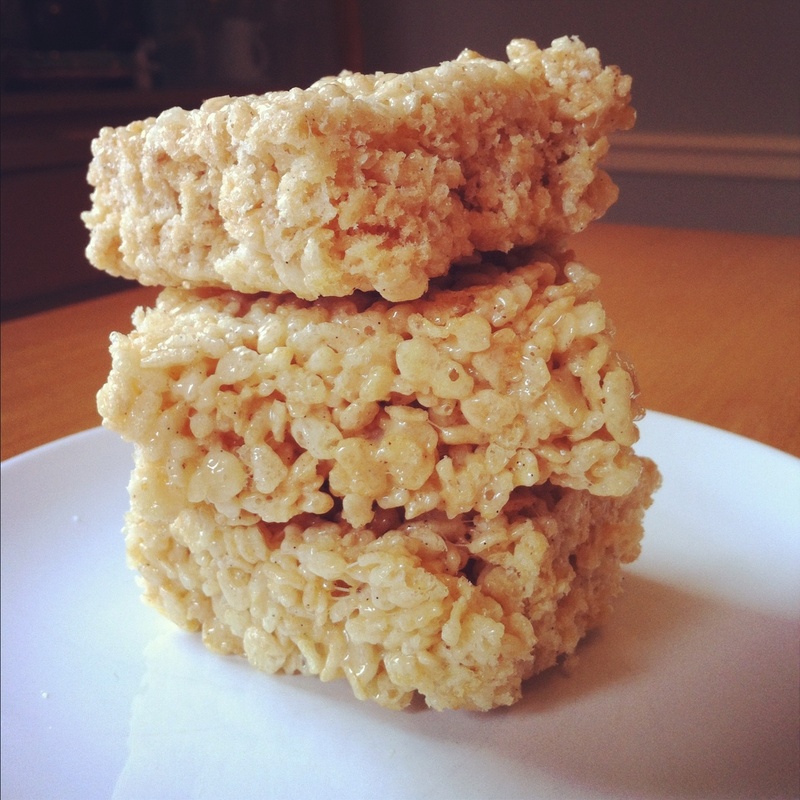 This is my first attempt at an actual recipe of my own (thanks to Kate Leahy over at Modern Meal Maker for guidelines on how to write a recipe), so hopefully this works for you. In the meantime, may you all live long and prosper in the year of the dragon, and that these noodles will give you a long and happy life. This morning, I was thinking about food–as usual–and a question came to mind: What was Martin Luther King Jr.’s favorite dish? Apparently, it was pecan pie. Oddly, I’d never thought to ask the question in years past, but other bloggers have, and paid tribute accordingly. But no one has taken King’s appreciation for the pastry as far as Peace Through Pie, a Texas-based movement that wants to start a pie-sharing tradition on MLK Day to promote, well, peace and understanding. Now that’s a cause I can get behind. I admit that I didn’t know that Martin Luther King Jr., pie and peace were somehow all connected when I decided to try baking a pie this weekend. Personally, I’m not a huge fan of pie-making, only because whenever I make a crust, it never turns out right–it’s usually mushy, and/or too dense. Whoever came up with the phrase “easy as pie” either lied or didn’t know how to make a proper pie. 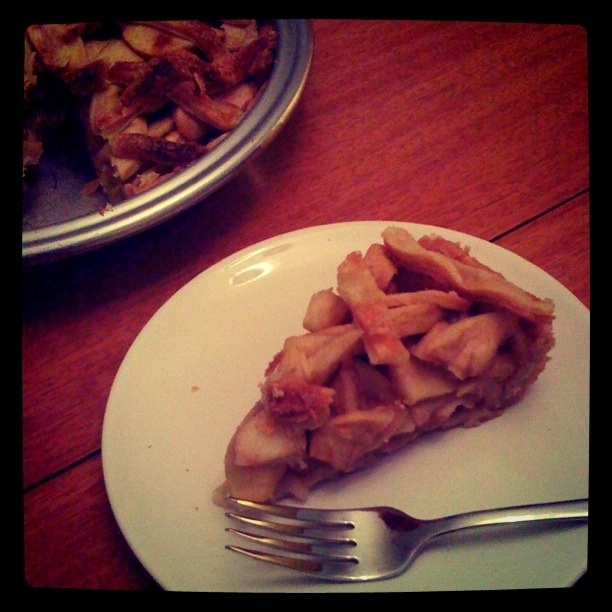 While flipping through the pages before bed–yes, I read cookbooks in bed before I turn out the light–I saw a recipe for a Two-Apple Pie, and an accompanying photo of a delectable latticed pie, packed to the brim with apple slices. It was irresistible, and it had to be mine. Anyway, I won’t go into great detail about the recipe, as there were many steps involved. 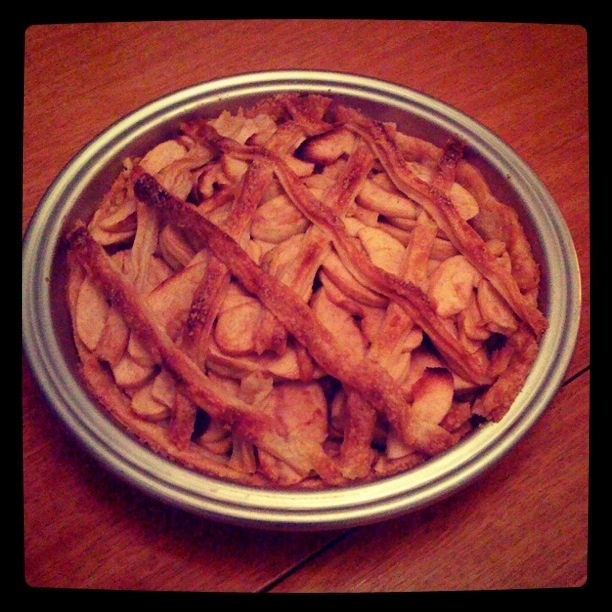 The whole process became a whole-day affair, because it required making and refrigerating the pâte brisée, chilling and blind-baking the crust, macerating the apples, making the lattice, then cooking and cooling the whole pie. Stick a fork in it--it's done. So there you have it. My inadvertent contribution to the Peace Through Pies movement. Thanks to Martin Luther King Jr. for leading the fight for civil rights–and for inspiring more people to eat and share more pie.